Explanation: What's that black dot over the Sun? The Moon. This past weekend, the Sun went dark during the day as the Moon completely covered it. The total solar eclipse was visible over a thin swath of Earth extending from northern Canada to China. As shown above, many sky enthusiasts gathered to witness the total or partial solar eclipse, which lasted only a few minutes. 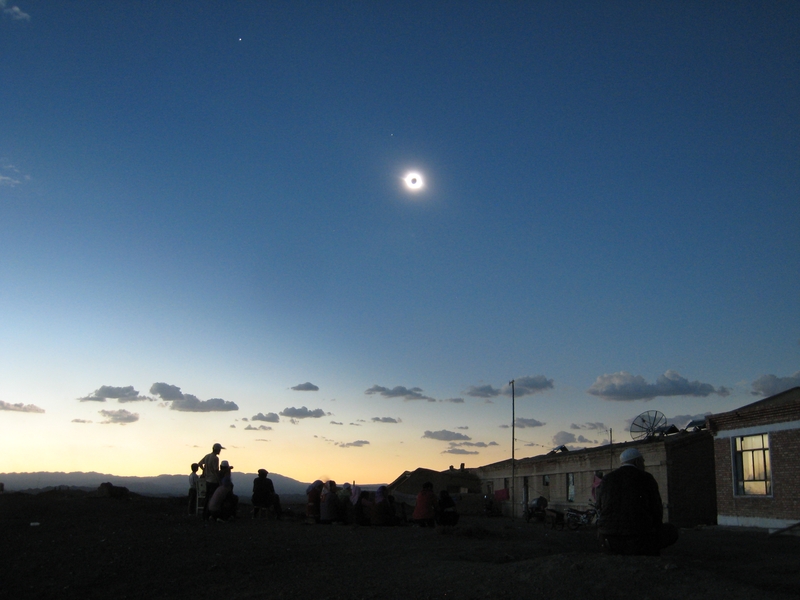 The above image was taken during totality near Barkol in Xinjiang, China, with the Barkol Shan mountain range visible on the horizon. Although the brightest parts of the Sun are covered, the normally invisible corona of hot gas surrounding the Sun became prominent. Just to the upper left of the Moon darkened Sun are planets Mercury and Venus. The increased darkening of the sky toward the right indicates the darkened atmosphere created by the passing shadow cone of the total solar eclipse. The next total solar eclipse will occur next July and be visible in parts of India and China.